The program, still in its testing and development phase, is currently available as a demo for Spanish–English translation. The makers of this technology warn that it can't easily identify regional dialects or drown out background noises. Once that glitch is fixed though, other languages are sure to follow! There are definitely many more improvements to be made, but could this be the future of international travel? Will people stop learning key foreign phrases when traveling abroad? Google Translate may do it all for them! But with the state of machine translation as it is now, we can expect to witness many language faux pas. 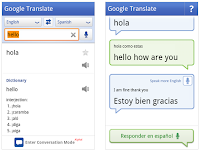 Google Translate on Android currently supports text translation in 53 languages and voice recognition in 15 languages.